Berlin, 26 September 2018 – The 18th International Anti-Corruption Conference will take place from 22-24 October in Copenhagen, Denmark under the theme Together for Development, Peace and Security: Now is the Time to Act. 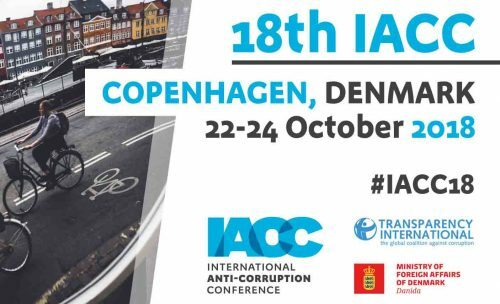 The world’s largest independent forum for fighting corruption will bring together more than 1500 participants from all over the world and will be opened by the Prime Minister of Denmark, Lars Løkke Rasmussen. The three-day event is hosted by Ulla Tørnæs, Minister for Development Cooperation of Denmark. Leading experts, innovators and activists from civil society, government, business and academia will debate in more than 50 workshops and 6 high-level plenaries how to turn anti-corruption pledges into concrete actions. They will discuss how we can work together towards sustainable development, peace and security in today’s increasingly polarised world where democracy is being weakened in too many countries. On the first day of the conference, the winners of the 2018 Anti-Corruption Awards, which honour remarkable individuals and organisations worldwide who expose and fight corruption, will be announced. The Films for Transparency festival with six screenings at the conference venue and ten in the City of Copenhagen from 20-25 October.